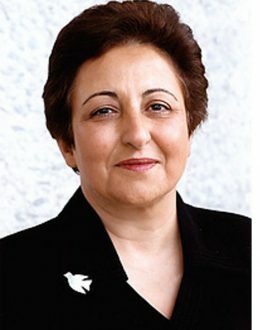 The Iranian lawyer and human rights activist Shirin Ebadi was born in 1947. She received a law degree from the University of Tehran. In the years 1975-79 she served as president of the city court of Tehran, one the first female judges in Iran. After the revolution in 1979 she was forced to resign. She now works as a lawyer and also teaches at the University of Tehran. Both in her research and as an activist, she is known for promoting peaceful, democratic solutions to serious problems in society. She takes an active part in the public debate and is well-known and admired by the general public in her country for her defence in court of victims of the conservative faction’s attack on freedom of speech and political freedom. Ebadi represents Reformed Islam, and argues for a new interpretation of Islamic law which is in harmony with vital human rights such as democracy, equality before the law, religious freedom and freedom of speech. As for religious freedom, it should be noted that Ebadi also includes the rights of members of the bahai community, which has had problems in Iran ever since its foundation. Ebadi is an activist for refugee rights, as well as those of women and children. She is the founder and leader of the Association for Support of Children’s Rights in Iran. Ebadi has written a number of academic books and articles focused on human rights. Among her books translated into English are The Rights of the Child. A Study of Legal Aspects of Children’s Rights in Iran (Tehran, 1994), published with support from UNICEF, and History and Documentation of Human Rights in Iran (New York, 2000). As a lawyer, she has been involved in a number of controversial political cases. She was the attorney of the families of the writers and intellectuals who were victims of the serial murders in 1999-2000. She has worked actively – and successfully – to reveal the principals behind the attack on the students at Tehran University in 1999 where several students died. As a consequence, Ebadi has been imprisoned on numerous occasions. On 10 October 2003, Shirin Ebadi was awarded the Nobel Peace Prize for her efforts for democracy and human rights, especially for the rights of women and children. With Islam as her starting point, Ebadi campaigns for peaceful solutions to social problems, and promotes new thinking on Islamic terms. She has displayed great personal courage as a lawyer defending individuals and groups who have fallen victim to a powerful political and legal system that is legitimized through an inhumane interpretation of Islam. Ebadi has shown her willingness and ability to cooperate with representatives of secular as well as religious views.